string(1594) "Manufacturing is where the lean movement originated from. For their MIT research in the late 1980s (which resulted in the 1990 seminal book The Machine the Changed the World), Jim Womack and Dan Jones identified a set of principles and techniques that made Japanese carmakers far more productive than their Western competitors. When applied to manufacturing, lean tools like heijunka, SMED or Kanban cards allow for the optimization of production processes and the systematic elimination of waste (in its three incarnations of muda, muri and mura – respectively, non-value-adding work, overburden and unevenness). These happen by implementing the fundamental lean principles of pull and flow. However, it has now been proved that the principles characterizing lean manufacturing are universally applicable. They work in any sector and they apply to any kind of work – even though at times they require some adjustment." string(1593) "The term “lean production” refers to the set of tools and techniques used to streamline and improve a company’s production system. With its roots in the Toyota Production System, lean production aims to boost productivity while reducing waste. Companies that successfully embrace lean production methods can achieve impressive improvements in their performance. The superiority of a lean production system was first identified by Womack and Jones during their research on Japanese carmakers. Initially, it was believed that lean was only applicable to production, whereas today we know those principles can be applied in any sector. With more and more organizations (not just manufacturing firms) turning to automation to try and solve every-day problems, lean production offers an approach that gives the operators and their work the dignity they deserve. This idea is best expressed by the concept of the andon, a cord hanging above lean production lines that operators can pull whenever they encounter a problem they can’t solve right way (this is the base of the fundamental lean principles of jidoka, “automation with a human touch”). Lean is clearly an alternative to reckless management that considers people as mere capital. The main characteristics of a lean production system are the fact the different stages of production happen in a sequence without interruptions (known as flow) and that the pace of production is set by the customers (pull)." 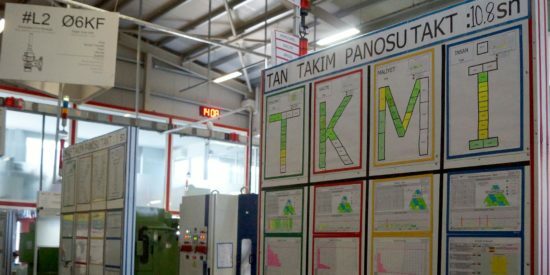 CASE STUDY – A Turkish producer of gas valves for kitchen appliances has discovered the power of the lean principles of pull and flow, reaching results beyond its imagination.